With my finals beginning on Wednesday and my brain fully switched to full-on study mode, I thought the discipline of studying would be a good one to discuss! I'll have 3 finals on Wednesday, 1 on Thursday, and 1 on Saturday, and then this semester will be over! To begin with, let me emphasize that everyone will have different methods of studying that work best for them. Each one has a different learning style (auditory, visual, kinesthetic, or a combination), so different ways of studying will work best for them. By sharing the things that work well for us, we may be able to give others ideas. However, bear in mind that what works perfectly for someone else may not work well for you as all! My learning style is very visual along with some kinesthetic things (and even auditory in some instances - I'm quite a combination learner! ), so that will naturally shape the methods that work for me. The place that you study is important in helping you to stay focused. My favorite place to study is outside in God's beautiful creation! It doesn't always work because of cold or inclement weather, but recently I have been taking advantage of the beautiful warm spring/early summer days to study beneath the trees on the lush grass. If I'm not outside, I'm usually in my dorm room, though I'll occasionally take advantage of breaks between classes to get in some studying in various buildings. Sometimes I'll go into a study room or quiet place just to have a change of scenery, for too much time alone in a room can make me feel restless. It is good to study in a comfortable location, but not one overly comfortable! You want to avoid irritating things like an extremely hard seat or annoying insects, but you also don't want to fall asleep because you're so comfortable! =) I generally study on the ground, in a rocking chair, or in a comfy chair in my room. Occasionally I'll study on my bed, but often can't do it for too long without feeling groggy. I study best in a quiet environment by myself; listening to music causes me to be distracted. Obviously, any environment is going to have some kind of distraction, be it the beauty of God's Creation, pictures on the wall, or people walking by, so it is important that you learn to focus your mind so as not to get too easily distracted. It's fine if someone else is in the room when I study if we're not talking (though an occasional comment is definitely fine! ), and in fact I enjoy having my roommate in the room while we study, to give a sense of companionship. Sometimes it is helpful for me to talk through things with people, but in order for it to be effective, I have to have studied earlier by myself and really begun to commit the information to memory. Thus, I generally avoid study groups, as I learn more quickly and effectively on my own. It's been my observation that in most study groups, more talking seems to get done than actual studying. This can be fine if you are combining school and social activies. If, however, you are in a time crunch and need to really learn something, studying alone usually goes more quickly. When I do homework/studying on the computer, I really need to watch myself, because I'll get distracted by checking my email or browsing online instead of doing the work that I need to do. Sometimes I will allow myself to take periodic breaks to do other things on the computer while I study, but I have to be disciplined in not letting it distract me that much. If I really need to focus, I have to use self-control to simply open whatever program I need to use and leave other things, such as tabs containing email and blogs, closed. As I've already written before, scheduling things helps so that you are prepared for classes in tests in plenty of time. Having a planner or table where you write when assignments are due and when tests will be given helps you keep track of what you need to focus on each day and week. By reviewing information throughout the semester, you will be able to recall it easier when you have to focus on it for an upcoming test. I wish I did this a little more than I do, for a little done each day often saves long hours done at the end. Start studying in plenty of time so that you are not frantically studying the night before. You may remember the information for the test, but if it's only stored in your short term memory bank, you'll usually lose it soon after you take the test. If the goal of your education is to truly learn the information, you want to try to retain as much as possible, although you obviously can't remember every single detail. I try to begin studying for a quiz/test from 3-7 days before I have to take it. The further back I start, the less review I have to do each day, and the better I usually learn the information. First I gather the information I need to focus on and make study helps, then I review once or twice each day, going through the information a few times. Usually I'll only have to study it for 10-20 minutes at a time, sometimes more or less. One or two days before the test, I'll review a little more frequently and for longer amounts of time, and often I'll look over everything again right before the test. Usually by that time I'm quite prepared and fully ready to take the test. I'm very much a visual learner, so it helps me to be able to see the information. I study a lot by simply reading and thinking through my notes, and I'll do that if I just have to remember general information. If I have to remember specific details or outlines, however, I go over and over them in order to commit them to memory. Writing down quotes and details as I read textbooks also helps me better remember what I read and gives me something to look back on when I need to review. I primarily use flash cards and a test prep program that my brother Elijah programmed many years ago. The flash cards I enjoy because I can study them anywhere - outside, walking between classes, at breakfast, etc. It's also nice to be able to reverse the flash cards if I'm trying to learn to identify both terms and definitions. Sometimes, however, I tend to go through the flash cards quickly without really committing things to memory. If I really need to memorize something, the test prep program works really well. It's set up so that I can type in the questions and the corresponding answers in a category (such as "Civilizations II Test 2") that I create. The program automatically mixes up the questions each time I go through them. The question shows up onscreen, and I type in the answer. If I get it right, it goes on to the next question. If I get it wrong, it shows me the answer, highlighting what I've typed wrong. Then, I try again, to see if I can now type it right, or if it is almost entirely right, I may just click on to the next question. This program has really been a huge help to me (thanks again Elijah)! By typing in the answers, I also am forced to learn the correct spelling of things, which can be very helpful with foreign names and long terms. Another thing that helps me when writing and reviewing my notes is to keep them organized, using many bullets. If I'm studying by reading over notes, I often highlight the key points so that they really stick out to me, and the yellow often helps them stick in my head. Sometimes I'll use colors for different things. Another helpful thing is to assign numbers to things when I'm memorizing them. Remembering the 5 points of an outline helps if I remember them by point 1,2,3, and so on, and remember that the number of details or items helps them stick in my head. Acronyms, letter patterns, and the rhythm of saying the words also sometimes helps. Helping my kinesthetic side, the typing (doing something) helps me as I commit things to memory. Sometimes when I'm recalling information, I will remember typing or writing it, and that helps me remember it. As I manipulate the flash cards with my hands or walk while reviewing them, this also helps me kinesthetically. I'm not a very high auditory learner, although for some things (such as memorizing lines or verses or songs) I unconsciously learn things just by listening to them again and again. For the most part in studying, however, I learn better by seeing, reading, and doing than I do by talking things through. Occasionally reviewing with a study partner helps, but again, it has to be prefaced by some study time on my own. Each class and test is different, so the method I use really varies. Some things only need a little review, others require long hours of committed focus. While homeschooling, I learned the information and then took pre-packaged tests that came with the curriculum, which were often based on the chapter reviews or bold print in the text. At college, the teacher usually tells you generally what to focus on, which helps. With it all, however, we have to pro-active in learning the information. Just going to class doesn't automatically make you absorb it. These principles of studying have allowed me to do really well while homeschooling and at college. Often others just tell me I'm smart and thus get good grades, but it really does require a lot of hard work in order to do well. I tend to over-study sometimes, but I would rather be over-prepared than under-prepared. I also have to remind myself that good grades aren't everything. Although we should do our best, our identity if found in God, not in a letter or grade point average. What kind of learner are you (auditory, visual, kinesthetic, combination, etc.)? What is your favorite location or environment in which to study? What study method(s) work best for you? 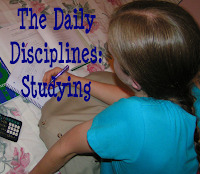 For more advice on Daily Disciplines, go here. Thank you, Anna! Your tips are always helpful. I'm mainly visual, though I don't mind a bit of doing and listening. If I read something, think through it, and regurgitate it (either in writing or thought), I usually remember it. Of course, though intelligence is one of the many gifts God has given me, I still do have to work at it. Thank you for this! I am not really sure what type of learner I am -- perhaps visual? I took a quiz once that was supposed to tell me, and I had high numbers saying I am a solitary learner. All the other categories were about even and quite low. I joke that I should be put in solitary confinement until I finish college, and I will do alright!